This was the first win for Tiger Woods since 2013 when he won the WGC-Bridgestone Invitational. His 80th win takes him within 2 wins of the overall PGA Tour record of 82, held by American Sam Snead. The TOUR Championship is a golf tournaments that is part of the PGA Tour. 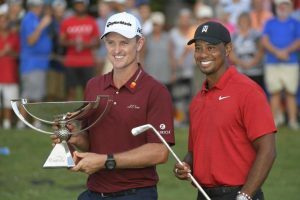 It has historically been one of the final events of the PGA Tour season; prior to 2007, its field consisted exclusively of the top 30 money leaders of the past PGA Tour season. From 1987 to 1996, several courses hosted the event. Beginning in 1997, the event alternated between Champions golf club in Houston and East Lake Golf club in Atlanta; since 2004, East Lake has been the event’s permanent home. Woods played incredible golf through this tournament, in particular off the tee, he drove the ball well finding fairways with ease. He finished the week as the best putter with the best ‘one putt’ percentage of 51.4%, he one putted so many times over the 4 rounds. It was really encouraging for him too see so many fans come out and support him, this then put so much pressure on his opponents. 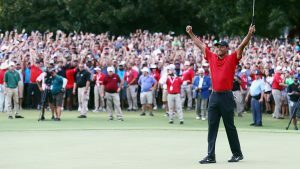 Tiger finished the tournament -11 under par two shots ahead of former winner and fellow American, Billy Horschelwho was in second place on -9. After coming very close to eagling the last, Billy birdied which took him to -9 for the week, a real feat since he was -5 before the start of his round. In third place was Dustin Johnson, the former number one golfer in the world, shot a very good 67 to move from -4 under to -7. Webb Simpson, Hideki Matsuyama and Justin Rose finished one shot further back in fourth on -6 for the week. This was particularly good news for Rose who was then presented as the winner of the FedEx Cup (awarded to the best overall player for the 2018 season) and received £10 million dollars! !